There were 2 product lines in NEC personal computers. PC-98xx (16bit) series for business, and PC-8xxx (8bit) series for home-entertainment. The PC-88VA 2 was a PC-8xxxx series machine but also had V30 complatible mode, called V3 mode (the NEC V30 cpu was upper compatible with the Intel 8086). Thus, tough it was designed for home entertainment, the PC-88 VA /2 could be used for businesses. PC-88VA /2 was one of the highest performance machine in 1987. Especially, its graphic features were remarkable. However, this machine was unfortunate. 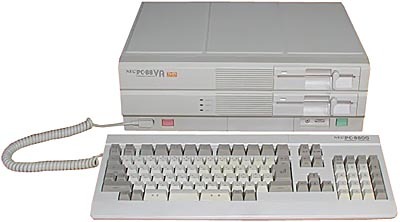 NEC released the PC-98DO system in 1989, a PC-98xx series system but but which could also run PC-88xx software. (PC-88VA was a 8bit machine and had a 16-bit mode. PC-98DO was a 16bit machine and had a 8bit mode. It was strange marketing decision...). At this point, PC-88VA /2 became an orphan. It's life ran out by his own mother. Thanks to Nomura, Hisayuki for these info. see more NEC PC-88 VA 2 Ebay auctions !